Track multiple remote stations generating LZA Own position messages. Track own station with NMEA position messages. Display position of stationary stations. Create track stores periodically, e.g. can create a new track store for every day or week. Change track point shape, size, and colour. Supports Vector and raster maps. Saves maps as layers in a spatial database that is geo-referenced on a globe that represents the entire earth. 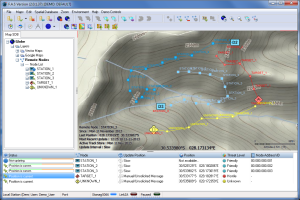 Easily swap between different spatial databases containing different maps and/or map styles. Automatically download and Geo-reference maps from popular map servers like Google maps, Bing Maps and Open Street Maps.